Ellensburg Pride March and Festival — CascadiaNow! Pride of Ellensburg (PoE,) a project of CascadiaNow!, is hosting the Third Annual Pride Festival. The event will be indoors this year, at the Hal Holmes Community Center. The fesitival will have main stage entertainment along with vendors and LGBT resources! There will also be games and activities this year to make the festival more fun and interactive! Later in the evening, in the same venue, will be PoE's annual Pride Drag Show! Prior to the festival. 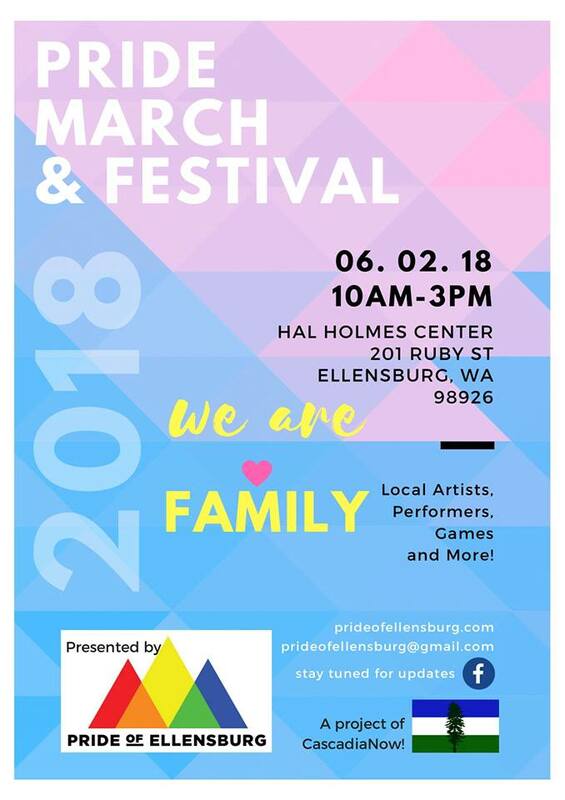 PoE will be hosting a LGBT march through Ellensburg. In years past, PoE has worked to have a Pride Parade leading to the festival. Unfortunately, due to cost, PoE is unable to do the parade this year. By hosting a march, PoE is pleased to invite the entire Ellensburg community to be proud with us! If you are interested in being a Pride Festival vendor or food truck, go to the Pride Registration page and follow the appropriate registration steps. The Pride of Ellensburg Facebook page will have updates on performers, confirmed vendors and ways you can help out! Thank you for your support, Ellensburg and Cascadia! PoE and CN! couldn’t do this without you!